Samsung's first phone to employ a front-facing punch-hole camera is the Galaxy A8s. Swiping down from the hole opens the camera app with an animated flourish included. We do expect the upcoming Samsung Galaxy S10 line to offer the same feature. Based on a pair of patent applications submitted to the World Intellectual Property Organization (WIPO) by Oppo, there are another ways to make the punch-hole useful. 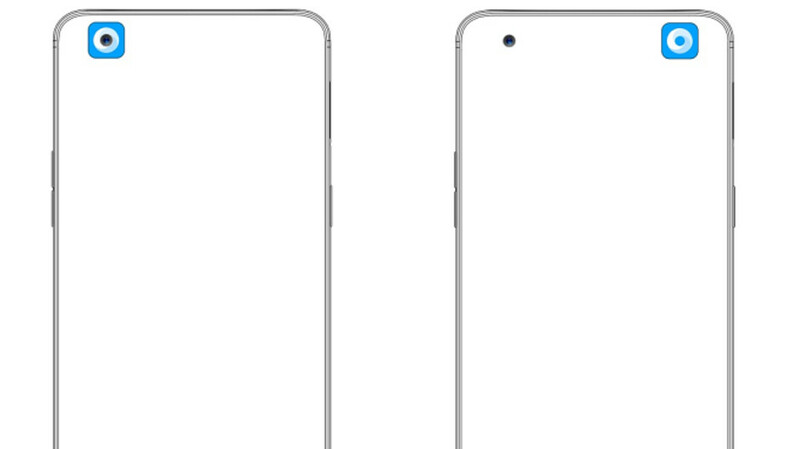 Oppo's patent applications are titled "Mobile phone with app icon interface" and the diagrams show an Oppo handset with a front-facing punch-hole camera on the upper left corner of the display. According to one filing, the camera icon overlays the punch-hole on the display, and clicking on it opens the camera app. Clicking the icon and swiping it to the right will turn off the camera app (see image at the top of this article). 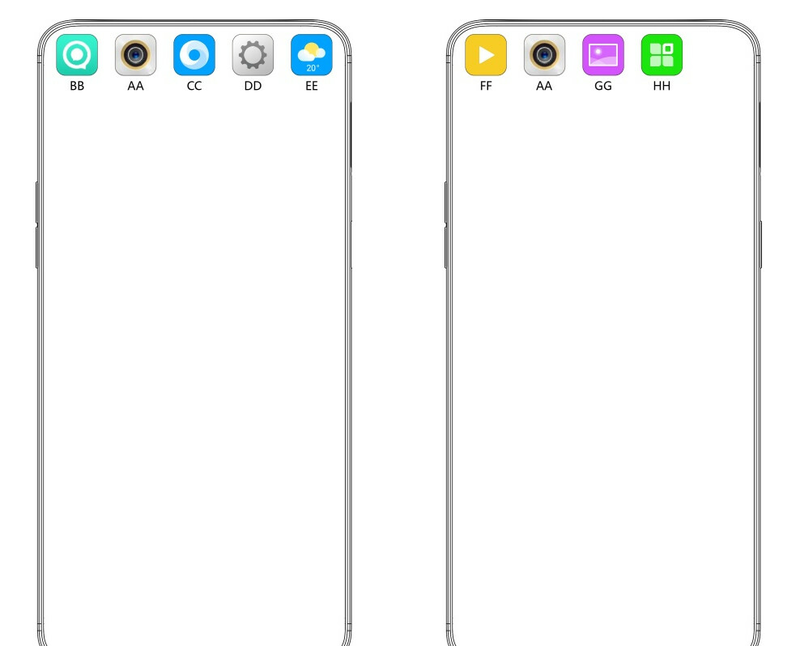 With the second filing (via Lets Go Digital-translated) there are five app icons at the top of the phone's screen, including the camera app that again overlays the punch-hole. Swiping on the apps allows other icons to appear, although the camera app always remains in the same spot (see image at the bottom of this article). Clicking on it opens the camera, and tapping on any of the app icons on the top of the screen will open that particular app. The first Oppo handsets to include a front-facing punch-hole camera are expected to be unveiled next month during MWC 2019 in Barcelona. Those models are believed to be the Oppo F19 and the Oppo F19 Pro. Both of those phones could also come with the company's 10x optical zoom technology, and an in-display fingerprint scanner that can be accessed anywhere on the handset's display. Or they could all just stop this hole punch nonsense immediately instead of having to come up with a solution to a problem that didn't have to exist in the first place. That's also an option. agreed... making it tough to hold a phone without finger prints all over the viewing area. Exactly. As if people have complained for years about having a 2mm bezel for all the camera/sensors. As it is with screen ratios pushing 90%+, you can hardly handle a phone without a stray input. You can always buy a Sony or any 3 year old phone and enjoy the huge bezels. So, where does the status bar go? That should definitely remain on top intact. In the prototype they just knocked it out. It would be so much simpler to leave a few millimeters on top. There they could put the sensors and cameras at ease. Then would end this agony of notches and holes. And everyone would be glad. Why 100% screen? Just to break easier and the phone makers to sell more units? Simple smart idea. However not for the folks how what 1inch bezel,this is not for you, buy a pirated iphone 4x lol. Whatever happened to the idea of putting the camera behind the screen and just turning off those pixels when a picture is taken or in between refresh cycles?